Want to dress up your Remington 700 or Rem-Clone receivers at a modest cost? Check out these new CNC bolt shrouds from Pacific Tool and Gauge (PTG). 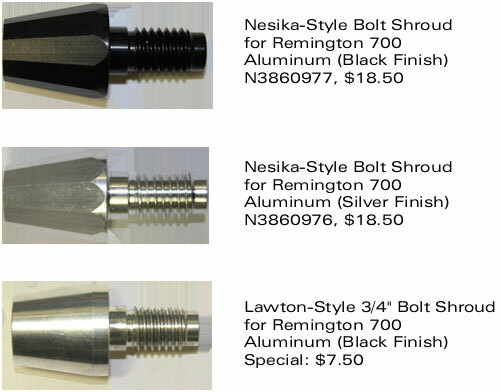 PTG now offers handsome Nesika-style and Lawton-style bolt shrouds for Rem-spec bolts. The aluminum Nesika-style shrouds come in silver or black finish and cost $18.50. The aluminum Lawton-style shroud comes in a silver finish only but it costs just $7.50 while supplies last. Give your Rem action the look of a custom, or enhance your Rem clone action for under twenty bucks. Many of you may not know this, but PTG now makes muzzle brakes — and they are a great value. The Standard Muzzle Brake, shown at right, costs just $49.90. It measures 1.80″ OAL .817″ x .940″ Taper (5/8-28 thread pitch). PTG’s Universal Short Muzzle Brake, with dimensions 1.100″ OAL x .750″ OD with 1/2-28 x .300 deep thread, is just $39.90. Though very affordable, these PTG muzzle brakes really work. 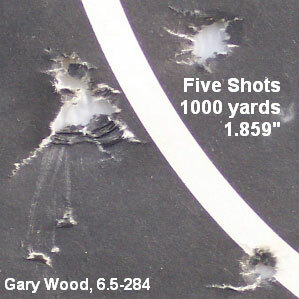 A well-designed muzzle brake can reduce felt recoil by up to 30% (depending on caliber). When installed properly, quality brakes normally won’t hurt accuracy, although they can affect barrel harmonics so you may need to adjust your load. This story suggested by Edlongrange. We invite other submissions from our readers. Disclosure: Pacific Tool and Gauge has advertised with AccurateShooter.com. Share the post "Pacific Tool and Gauge Offers Bolt Shrouds and Muzzle Brakes"
How do you haul a heavy front rest, jumbo rear sand-bag, ammo boxes, and all the miscellaneous gear you need for a Benchrest or F-Class match? 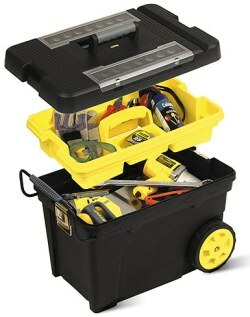 Stanley makes an inexpensive, lockable Pro Mobile Tool Chest (product 033023R) with a 25-quart capacity that holds plenty of gear. This wheeled tool chest is big enough for large joystick rests, and rolls on large rubber-coated wheels. Two feet long and 16″ deep, the cargo compartment has lots of space for the big stuff, and the included yellow tool tray will hold smaller components such as dies, priming tools, and loading blocks. On the left and right side of the top lid are two small transparent parts compartments that can store small parts, bullets, ear-plugs, nuts and bolts. Overall, it’s a very handy, versatile rig. 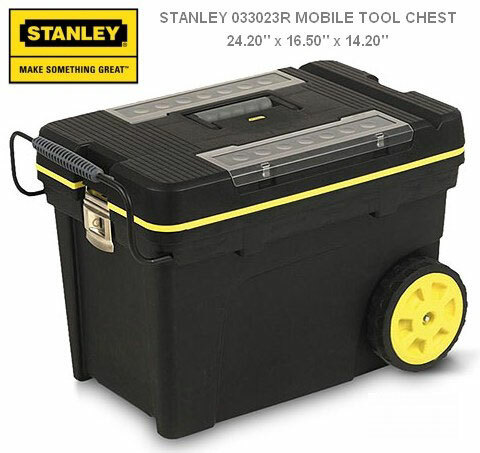 The Stanley Pro Mobile Tool Chest, model 033023R, is available online and through major home hardware stores. Amazon.com sells the Pro Mobile Tool Chest for $48.68. And if you want even more storage space, Stanley makes an even larger 19″x29″x18″, 24-gallon-capacity wheeled chest (product 029025R) that sells for $70.49. 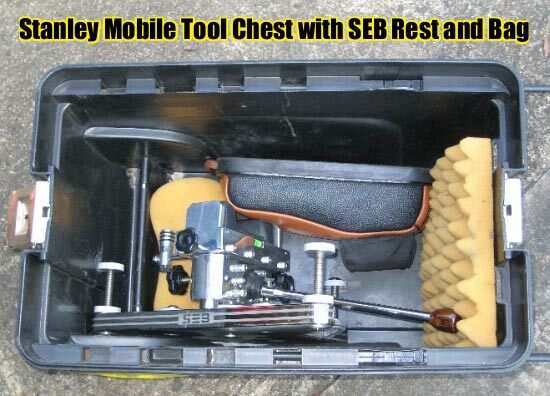 Share the post "Stanley Rolling Tool Chest Holds Your Bench Gear"